Regarding changes over time in subpopulation sizes, we must not forget that population numbers at any given time are estimates – they are derived from mathematical models that vary in their assumptions, limitations and input information (including counts of animals from field surveys). Because these models have changed over time, subpopulation estimates of polar bears are seldom truly comparable, either within or between regions – not a perfect situation, but it’s all we’ve got. Figure 1. 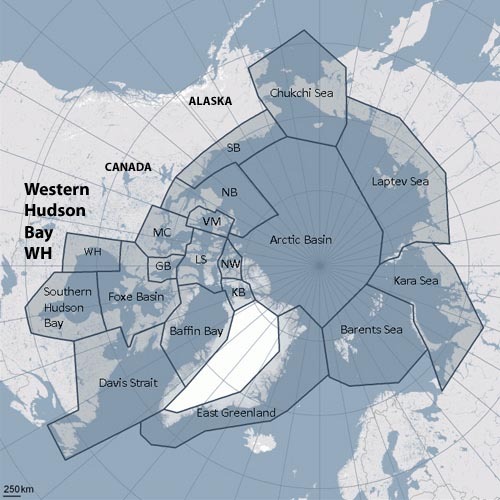 The 19 polar bear subpopulations, with the Western Hudson Bay (WH or WHB) region marked. Note that parts of Davis Strait, between Labrador and southern Greenland, lays at about the same latitude as WHB. Polar bears in WHB, Davis Strait and the Barents Sea (east of northern Greenland) suffered particularly high levels of harvests between 1890 and 1930 and again between 1945 and 1970. Modified from map provided by the IUCN Polar Bear Specialist Group. By 1993, this estimate had been increased to 1,400, to “account for the realization that the bias in sampling caused by the inability of researchers to survey the extensive area of offshore pack ice was greater than had previously been thought and, to account for additional scientific information (I. Stirling and M.K. Taylor, unpublished data)(Derocher et al. 1998:27)”. This suggests we should use 1,400 as the baseline population figure for Davis Strait. The most recent estimate was 2,142, from studies in 2007 (Obbard et al. 2010:116), an overall increase of 153% over the 1993 revised estimate. So, while we know the Davis Strait subpopulation must have increased from a depleted point, we don’t have a trustworthy number for the early period (the late 1970s), only a “mid-point” estimate. The WHB population in 1981 was estimated at about 500 animals (range in estimate, 300-700)(Stirling et al. 1999), see Fig. 2 below. As this graph shows, the estimate in 1985 was about 1,525 bears (with a large range of possible error: 1,050-2,000) – an increase of over 1,000 animals in 4 years. If there are questions regarding the veracity of these figures – like the caveats given for Davis Strait – they are not discussed in this paper. By the time of the 1993 Polar Bear Specialist Group report (Wiig et al. 1995:19), the population estimate for WHB was given as 1,200 (survey year not given, perhaps 1989? See Fig. 2) but with a caution that this number “should be considered conservative [i.e. low] because a portion of the southern range has not yet been covered by the mark-recapture program.” This gives some credence to the earlier 1,525 estimate. By 1995, the population estimate was again given as 1,200 without caveats (Derocher et al. 1998:21). Figure 2. WHB population estimate graph for 1981 to 1997 that appears in Stirling et al. 1999. Note the spike of sorts for 1985, of 1525 (range about 1050-2000). It appears that the population increased from about 500 animals in 1981 to about 1,525 in 1985, an increase of 305%. The population then fell to about 1,200 animals in the mid-90s, a level about 240% more than the first census. In 2009, the WHB subpopulation was estimated at 935 individuals (range 791-1079), based on data collected in 2004 (Obbard et al. 2010:67), down from 1200 in 1997 (Lunn et al. 2001) – a decline to 187% of the first census (similar to the increase estimated in Davis Strait). Accepting the numbers as given, it appears there had been a substantial increase in the WHB population prior to 1985, with a modest decline after that – but even still, in 2004 there were almost twice as many polar bears in western Hudson Bay than there had been 23 years before. In other words, the population size at the time harvesting polar bears was banned in Svalbard (1973) was unknown and ten years later, the estimate was so tenuous as to be useless. The 2004 estimate is probably the only one that can be relied upon, which means we have no real idea of how the population responded to the intense levels of harvesting prior to the 1960s and which were particularly horrific in the early 1900s. …Further research in the population is needed to determine whether the changes in the population are part of longer-term fluctuations or directional changes associated with density-dependence or climate change. “Density-dependent responses” or “density-dependent changes” means a population is declining because it got larger, during a period of population growth, than its sustainable size – in other words, a natural decline following population growth. So Derocher’s comment means that the population decline in Svalbard may be entirely natural. There are no data available on cub production, condition of females or age at weaning for the polar bears of this region. The incidence of triplets in WHB did not change between 1980 and 1992 – see Fig. 3 below (about 12% of all litters were triplets). While Ian Stirling claims that recently “triplets are rarely seen,” he has not provided data to back up this assertion (see discussion in previous post here). Figure 3. Incidence of twins and triplets among western Hudson Bay (WHB) and southern Hudson Bay (SHB) subpopulations (left of the bar in the middle), compared to other northern regions (Svalbard in the Barents Sea, Wrangel Island in the Chukchi Sea, “Northern Regions, Canada,” subpopulations not specified. Data from references in square brackets [#] below. In summary, it appears the number of independent yearlings in the population declined substantial between 1980 and 1998 (and perhaps more so recently) and it seems likely that the incidence of triplets may also have declined in recent years. If so, however, this only puts WHB bears on equal footing with bears in the High Arctic, who virtually never have triplets or wean their young at 1.5 years(Ramsay and Stirling 1988; Van de Velde et a. 1993). In other words, the well-documented change from weaning at 2.5 years rather than 1.5 years had no immediate negative impact on the population. Wiig (1998:31), during his study of Svalbard reproduction between 1988 and 1993, noted a 2 year birth interval in a number of bears, suggesting that as in WHB, a signficant percentage of cubs were weaned at 1.5 years. …The mean litter size of cubs and yearlings, litter production rate and natality found in this study were similar to those reported from other populations. …The changes in age-structure, reproductive rates and body length suggest that recovery from over-harvest continued for almost 30 years after harvest ended in 1973 and that density-dependent changes are perhaps being expressed in the population. …The dynamics of this population are only partially understood and are related to a history of intense harvest that resulted in a severely depleted population (Larson 1986). We know that the bears of WHB, Svalbard/Barents Sea and Davis Strait all went through an extended period of intense harvests prior between 1890 and the late 1960s and therefore, all three populations were likely well below pre-harvest levels in the early 1970s. We have evidence of significant population increases since then in two of them (Davis Strait and WHB – the Barents Sea increase is assumed, not documented), and details on changes to reproductive characteristics during that population increase in two others (Barents Sea and WHB). For WHB, we have evidence that absolute numbers of polar bears as well as reproductive parameters declined after the population growth phase (although some details have not been released, see previous post), bringing the reproductive characteristics on par with levels documented in the Canadian High Arctic, where polar bears were minimally impacted by fur traders, whalers and sport hunters. Similarly, there is evidence from Svalbard that the bear population there is no longer in a growth phase following prior overharvests, since it now has similar proportions of triplets and independent yearlings as other populations in the Canadian High Arctic. Here’s the difference: in Svalbard, the fact that reproductive parameters (including percentages of triplets born) are now similar to High Arctic populations are considered either evidence of a natural decline after years of high growth rates or effects associated with changes in sea ice conditions (with no evidence strongly indicating one rather than the other) while in Western Hudson Bay, these same changes are now blamed exclusively on a declining trend in sea ice cover attributed to anthropogenic global warming. Derocher, A., Garner, G.W., Lunn, N.J., and Wiig, Ø. (eds.) 1998. Polar Bears: Proceedings of the 12th meeting of the Polar Bear Specialists Group IUCN/SSC, 3-7 February, 1997, Oslo, Norway. Gland, Switzerland and Cambridge UK, IUCN. Lunn, N.J., Schliebe, S., and Born, E.W. (eds.). 2001. Polar Bears: Proceedings of the 13th meeting of the Polar Bear Specialists Group IUCN/SSC, 23-28 June , 2001, Nuuk, Greenland. Gland, Switzerland and Cambridge UK, IUCN. Stirling, I., Lunn, N.J. and Iacozza, J. 1999. Long-term trends in the population ecology of polar bears in Western Hudson Bay in relation to climate change. Arctic 52:294-306. Uspenski, S.M. and Kistchinski, A.A. 1972. New data on the winter ecology of the polar bear (Ursus maritimus, Phipps) on Wrangel Island. Bears: Their Biology and Management 2:181-197. This entry was posted in Life History, Population and tagged commercial harvest, Davis Strait, Hudson Bay, population size, Svalbard, triplets. Bookmark the permalink.